Perhaps more people than ever before are now considering hiring an apartment mover to haul their belongings from the old place, to the new in Media, Pennsylvania. There are many reasons why people may be opting out of doing the packing, lifting and transporting themselves. In today’s society, we may find ourselves rushing to and from without extra hours to take on a time-consuming project like moving. By hiring professional apartment movers from Suburban Solutions in Media, PA, not only may someone be saving time and energy, but also preventing enduring an injury such as a sprain, pulled muscle, broken bone, mild concussion, or overexertion. Here we have answered several questions a person may have about what a moving company offers, and the various benefits for hiring professionals to do the hefty hauling out of your apartment for you. Can a moving company do the packing for me? The majority of moving companies may offer a service to do the packing for you. Moving professionals understand how things fit together, and may end up using less boxes than if you were to pack things yourself. With less boxes to haul, that means it may cost you less money as well, since moving companies often calculate their prices based on how long and how much stuff you have to move. What materials may the movers have access to, that I don’t? Apartment movers in our Media, PA location have many tools to help make the moving process run smoothly, in addition to keeping your stuff damage-free. For example, the professionals may have heavy duty wrap, plastic covers, floor dolly, hand truck, straps, moving blankets/pads, shrink wrap, ramps, rope, standard tools and more. The cost to purchase or rent all of this equipment may be too steep for the average person. And, if a person does not know how to properly use these tools, they could end up injuring themselves and having to hire help anyway. What injuries could I sustain if I do the moving myself? 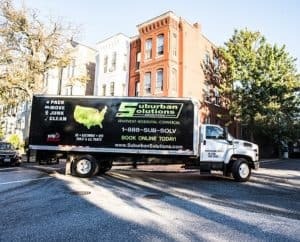 By hiring Suburban Solutions, you will have a team of dedicated and experienced apartment movers for your move in Media, PA. Our team is trained to move your items carefully to ensure they arrive safely to your new home, as well as our team staying safe and you never having to worry about getting injured. For peace of mind and the assurance of an easy move, contact Suburban Solutions today.